In birds, there is no true tonsillar ring in the pharynx present as in mammals (the ring of Waldeyer). Diffuse lymphocyte infiltrations and aggregations however are abundant. This lymphoid tissue is referred to as pharyngeal tonsil, although it is not organized and lacks tonsillar crypts. A recent studie (Crole and Soley, 2012) reports the presence of a real pharyngeal tonsil with the typical morphology with crypts in two ratite-species. 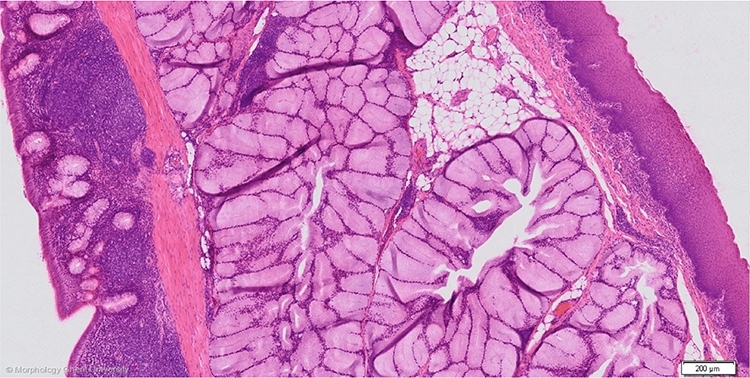 The micrograph above shows scattered and aggregated lymphoid tissue just underneath the epithelium of the oropharynx (on the right) and in between the mucosal glands. In the propria of the nasopharnynx (on the left), also lymphoid follicles are present.